It's the unfortunate reality that there are some species of Adirondack wildlife that can cause problems for land- and homeowners. A few common sense suggestions will help you avoid conflict with these animals, keeping the environment safe for them and for you. All photos on this page have been provided by Gerry Lemmo. Bats may intentionally take up residence in your home, or they may enter accidentally through an open door or window. They are the only mammals that have the ability to fly, and are recognizable by their 8"- 9" wingspan, brown fur, and pointy ears. 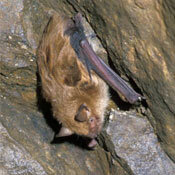 Bats are blind, so they rely on echolocation, or sound waves, to determine where objects and food sources are located. During the warmer months of spring and summer, bats are most active at early dawn and dusk, and can be seen chasing the insects they eat. Wherever flying insects are most commonly found, like near bodies of water or groups of trees, bats are most likely to be found as well. Bats hibernate in the winter, and this is when you would be most likely to find them in your attic, garage, or other enclosed space. Should you come across any bat, hibernating or otherwise, in your home or in the wild, it is imperative that you do not attempt to handle it. If provoked, bats could bite, and they have the ability to spread serious diseases, like rabies, to humans. An estimated 50-60% of New York State's 6,000-8,000 black bear population lives in the Adirondacks, which means you're more likely to come across one here than anywhere else in the state. These bears are very large, with adult males averaging 300 pounds and females averaging 170 pounds. 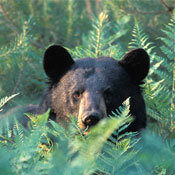 Black bears are dormant in the winter, and should never be disturbed during hibernation. Black bears are smart enough to realize that while food in the forest is good, some of the items that humans leave out are even better and require less effort to get to. This is why bears are commonly found going through trash cans or eating seed that's fallen out of bird feeders. When bears repeatedly get food from the same human source, whether the human gave it intentionally or unintentionally, it can result in bears losing their fear of humans and becoming bolder (and more dangerous). Coyotes have become increasingly common in the Adirondacks since the 1930s, and it is believed that this can be attributed to the extinction of wolves within the blue line. Coyotes and wolves fill largely the same niche, and even their dog-like physique resembles one another. Coyotes are smaller than wolves, and typically average between 4 and 5 feet in length and between 35 and 45 pounds in weight. They are highly territorial pack animals, and are unlikely to cross into another pack's territory. 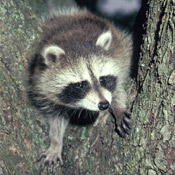 Although they prefer to live in wooded areas, they have been known to spread into suburban and urban areas. 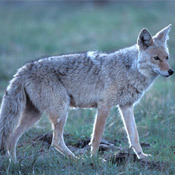 Coyotes don't commonly aggress humans, but are a significant threat to small domestic pets who spend time outside. To avoid conflict with coyotes, you should never feed them. You should also take care to remove unintentional food sources from your property, like pet food, bird seed, or accessible garbage cans. Don't allow a coyote to approach you, your children, or your pets, and always behave aggressively if you see one. Adult raccoons typically weigh around 15 pounds, and have reddish brown or gray fur. They are most easily recognized by the rings on their tail and the black fur that surrounds their eyes, creating the appearance of a mask. Raccoons are nocturnal, and prefer berries, nuts, fruit, and small animals or insects in the wild, but will venture to human dwellings and consume pet food and garbage when it is available. The density of raccoons tends to be quite high, and the DEC estimates that it may be 20 - 40 raccoons per square mile in rural areas, and as high as 100+ raccoons per square mile in more developed regions. Even with this high density, raccoons generally are not a problem until people intentionally or unintentionally provide them with food or shelter. To ensure that a raccoon doesn't take up residence on your property, secure garbage cans and remove pet food or bird seed from your property. Attach the lid of the garbage can to the handles using a bungee cord or other fastener to keep raccoons from pulling it off. Block any raccoon-sized openings that could lead under your deck or into your house, but refrain from permanently sealing openings until you are sure all animals have left. If you see an injured, orphaned, or potentially rabid raccoon, or believe you have an abundant population living in or near your house, don't hesitate to contact nuisance wildlife control personnel. Most people know skunks for the extremely foul substance they spray at people or animals who attack, disturb, or startle them. Even if you've never seen a skunk before, you may have smelled one. Striped skunks are predominately black with white markings that extend from their head and into a 'V' on their back and tail. They are generally the same size as house cats, and are known for the durability of their fur. Skunks prefer to live in open areas, like fields and pastures, and are commonly found living in residential areas with large, well-kept lawns and ample shade. Skunks are nocturnal and search at night for nuts, grasses, berries, insects, grubs, worms, cottontail rabits, and other small animals. They do not hibernate, but do remain inactive for periods of time in the winter. Skunks tend to be fearless, so action should be taken to seal up any holes or crawl spaces where skunks could enter your property or your home. 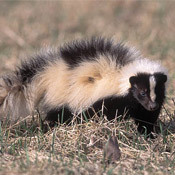 If you see a skunk, it is best to ignore it to avoid the potential for being sprayed.